After an unexpected bomb attack on the MI5, incompetent spy Johnny English is the only agent left alive when the crown jewels are stolen. English and his sidekick Bough (Ben Miller) are assigned to the case. For English, the prime suspect is mysterious French Entrepreneur Pascal Sauvage (John Malkovich). They soon learn the horrifying plan behind the theft, for Sauvage intends to wear them when he is crowned King of England. The film is directed by Peter Howitt (Sliding Doors, Antitrust) and written by writing duo Neal Purvis and Robert Wade (SS-GB, Spectre), who met at University of Kent alongside William Davis (Puss in Boots, Ignition). Rowan Atkinson (Bean, The Lion King) takes the feature role with a supporting cast of Ben Miller (Death in Paradise, The Armstrong and Miller Show), Natalie Imbruglia (Neighbours, Closed for Winter) and John Malkovich (RED, Dangerous Liaisons). Johnny English soon meets Interpol Agent, Lorna Campbell (Natalie Imbruglia). After his case is taken away from him, she tracks him down and together they vow to stop Sauvage’s plan. As English and Campbell race to France they drive down the familiar A2 carriageway leading to Jubilee Way. Kent’s brief cameo continues as we see the car drive down Marine Parade past the sign for the Port of Dover. The cameras would not have been a strange sight to local Dover residents. The town and surrounding landmarks have played host to many productions over the years. The famous Dover Castle alone has starred in many feature films. The site can be seen replicating another iconic British landmark like the Tower of London in the films Lady Jane (1987) and The Other Boleyn Girl (2008). Johnny English is not the only spy to have visited the Port of Dover. In the famous 1971 film Diamonds Are Forever (1971), Sean Connery stars as the suave spy 007. The Port makes its appearance as 007 foils diamond smuggler Peter Franks and boards a hovercraft bound for Amsterdam. 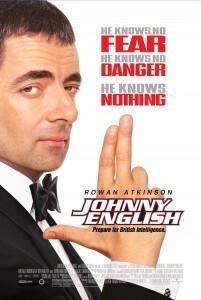 Johnny English was released in cinemas in April 2003 and can now be purchased on DVD. This entry was posted in Filmed in Kent and tagged A2 Carriageway, feature film, Johnny English film locations, Port of Dover, Rowan Atkinson. Bookmark the permalink.